Just this morning, my wife and I were discussing the fact that some standout college football players never make it in the NFL. (We have some interesting conversations in the morning.) This is a perfect example of how some skills don't translate. Someone can be very good, even the best at something in one arena, but when tested in a similar, but different setting, this person does not continue to shine. The reasons why this happens are far-reaching, but there seems to be a never-ending supply of those who attempt to stretch their wings and try to take their talents to a new venue, only to see themselves fail. Will this be the fate of stand-up comedian Jim Gaffigan, as he tries his hand at his own sitcom? The Jim Gaffigan Show is based very closely on Gaffigan's real life. Here, he plays Jim Gaffigan, a stand-up comic who lives in a two-bedroom apartment in New York City with his wife, Jeannie (Ashley Williams), and their five children. When he's not at home in the chaos, Jim spends his time with fellow stand-up Dave Marks (Adam Goldberg). Unfortunately, Jeannie likes to spend time with her old boyfriend, Daniel (Michael Ian Black). Despite the fact that Daniel has come out of the closet and is technically no threat to Jim, the two are always at odds. With everything going on in his life, Jim finds plenty of material for his act. It would be a wild understatement to say that they didn't break the mold with The Jim Gaffigan Show. Here we have yet another Seinfeld clone in which a stand-up comedian plays a stand-up comedian. What a stretch! This show goes the extra mile by basing the entire concept on Gaffigan's real life. He really is married to a woman named Jeannie. They really do have five kids. They really do all live in a two-bedroom apartment in New York. They really are very Catholic. Clearly, Gaffigan and co-creator, veteran screenwriter Peter Tolan felt that concept was bizarre enough to make it the backbone of a television show. They then throw in a very cliched slacker best friend in Dave to complete the very stereotypical "dad who married above his status who can't do anything right" character. In a show like this, the key factor is the main star and Gaffigan's schtick is just unusual enough to make The Jim Gaffigan Show somewhat different from its peers. Again, Gaffigan, Tolan, and frequent Co-Writer Jeannie Gaffigan stick to the strengths of the persona which Gaffigan has created in his stand-up routine (which, for all we know, is real). So, we get a guy who is obsessed with food and being lazy and only helps out with the kids when it's absolutely necessary. (When it's his turn to watch the kids, Jim simply takes them to the deli.) How does this make him any different from the other buffoon dads on TV? This show pushes Gaffigan's obsession with food (and his denial of this obsession) to absurd heights. Even Homer Simpson doesn't eat this much. The show also benefits from the presence of Gaffigan's brand of laid-back sarcastic humor and he throws in some great one-liners here. I caught The Jim Gaffigan Show when it premiered on TV Land (?!) and I was not impressed. This disappointment sprang from the fact that the show was simply too sitcommy and not what I'd expected. Having now binge-watched the entire first season, my opinion has changed somewhat. There is no doubt that the storylines here are straight from Sitcom 101, as most deal with misunderstandings or silly mistakes which must be hidden. However, there is just enough clever and acerbic humor here to raise the show above the norm. Each episode moves along at a nice pace, and none of the characters are annoying. I would still choose a new Jim Gaffigan concert over The Jim Gaffigan Show, but his fans will find something to like here. The Jim Gaffigan Show: Season One features some great cameos from other comedians on DVD courtesy of TV Land. The two-disc set contains all eleven episodes from the show's first season. The show has been letterboxed at 1.78:1 and the transfer is enhanced for 16 x 9 TVs. The image is very sharp and clear, showing no overt grain and no defects from the source materials. The colors look fine and the image is never overly dark or bright. The level of detail is fine, but some shots do look a bit soft. For this reason, the video is not quite as good as HD broadcast quality. The DVD carries a Dolby Digital 5.1 audio track which provides clear dialogue and sound effects. The show's annoying beat-box-like theme song delivers obvious stereo effects, and there are some effects from the front channels during the street scenes. Otherwise, the audio is fairly standard center-channel stuff. 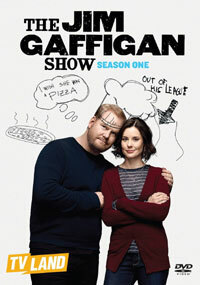 The Jim Gaffigan Show: Season One DVD contains no extra features.